The unique attributes of this aircraft make it impossible to list all end uses. 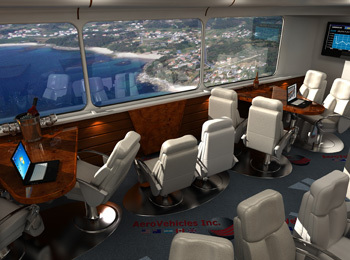 Therefore, AeroVehicles has identified very important Priority End Use configurations benefitting the entire world. The need to build AeroCat for disaster/humanitarian aid and combating wildfires is evident; however, it is impossible to ignore the other uses for this unique aircraft. In 2004, AeroVehicles had compiled over forty (40) separate end uses for the AeroCat. 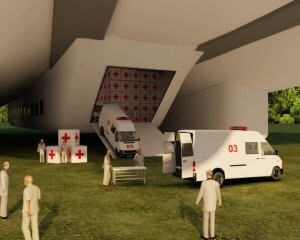 Many are civilian end uses such as remote mining, cargo transportation, and tourism. The U.S. Military and militaries from other countries have also expressed interest along with many agencies for border patrol and search and rescue. When the unique capabilities of the AeroCat are understood, potential customers invent new applications. During the last eight years, AeroVehicles has learned the uses for AeroCat are limited only by imagination. With a unique air transport aircraft, estimating market potential is difficult at best. However, to date 40+ potential market uses have been identified and analyzed. Commercial market interest comes from cargo and passenger transportation, agriculture, mining, and tourism. Government interest includes various departments from Argentina, Brazil, Mexico, Panama, and the United States for utilization in disaster relief and border patrol operations to name a few. Meanwhile, potential clients continue to invent new applications. Battling fires in remote areas is a specialized process. You do not extinguish a wild fire, you encircle and contain it and allow the fire to burn out which occurs when all the fuel is consumed. The quicker a fire is contained, the lower the damage. Rugged terrain and weather can combine to make containment very difficult and extremely dangerous. The fastest method of containing a fire is to encircle it with a wide path of flame retardant (a firebreak) at least 125 feet wide. At present there is no way of doing this, conventional aircraft or helicopters lack the capability. Only AeroCat, because it can fly lower and more slowly, can lay down a controlled path of fire retardant. Containment can be achieved in a matter of hours instead of days or even weeks. Configure the AeroCat with accommodations for multiple crews, tracking and search sensors, emergency medical facilities, plus equipment for land and sea rescues and you have the most versatile and capable aircraft able to respond, locate and direct search and rescue missions anywhere. AeroCat can be used for offshore and remote search and rescue for up to eight (8) days. Low speed and low altitude significantly improve visual surveillance for pipeline patrol. AeroCat’s endurance allows it to operate for days with a crew and equipment in a surveillance and maintenance mode or can be in standby mode for emergencies. AeroCat is the perfect mobile exploratory lab. With the ground footprint rating of less than 5 pounds per square inch, AeroCat is capable of carrying drilling equipment, personnel and supplies to otherwise inaccessible, cost prohibitive or environmental sensitive locations such as the Antarctic, Alaska and Canada’s Northern Territories. AeroCat’s long flight endurance is perfect for monitoring these same areas for illegal operations such as drilling, poaching, mining, etc. The initial AeroCat variant will find utilization as a specialized carrier. This could be anywhere in the world that lacks adequate roads or where roads cannot be built such as Alaska, Antarctica or the tundra of the Northwest Territories of Canada. The Aerocat is fully equipped for long endurance surveillance flights providing extremely comfortable workstations utilizing the latest technology, crew bunks, and a galley. An exercise area can also be included in the cargo area along with rescue and interdiction equipment if required. AeroCat can operate hosting radar and high altitude surveillance systems for a fraction of the operative cost required by other traditional platforms. Depending on configuration, AeroCat can take operations lasting from 36 hours up to 8 days without refueling. AeroCat is particularly suitable for border patrol in dense rainforest and large desert areas as well as for high sea fishing surveillance and law enforcement missions. With the appropriate equipment installed Aerocat will provide excellent monitoring, tracking and emergency response to earthquakes, avalanches, lost or missing persons, aircraft or watercraft almost everywhere. No other manned aircraft, existing or in development, combines all of these capabilities. 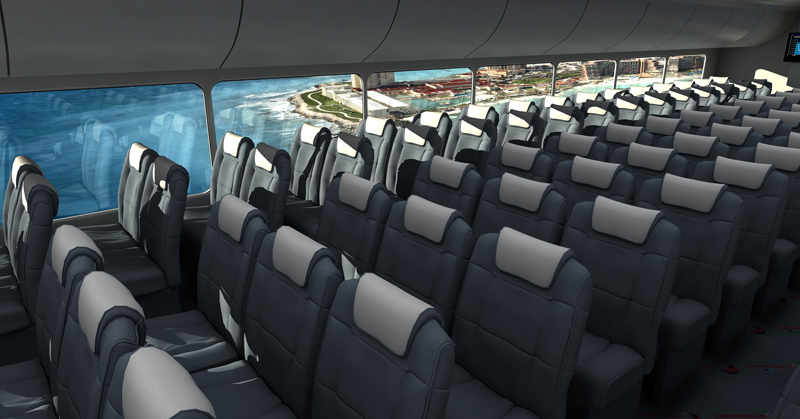 With its slower airspeed, lower altitude and large windows, AeroCat is unsurpassed for sightseeing. Furthermore, its landing capability affords new tourist opportunities. 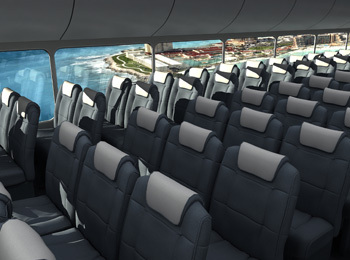 Imagine an AeroCat landing alongside a cruise ship to pick up passengers for a day of sightseeing over an island paradise. Two very large LED Screens can be attached to the AeroCat (one to each side), screens capable of full motion pictures, visible both day and night. Flying over a city or sports event these screens will have great visual impact for advertising or public relations. In the case of civil emergencies or natural disasters the screens can be used for emergency alerts, response instructions or directions for assistance. AeroCat has many potential uses for passenger transport such as a short-range regional commuter or from rural areas into municipal airports. It could also ferry passengers to national airports where landing slots are not available. 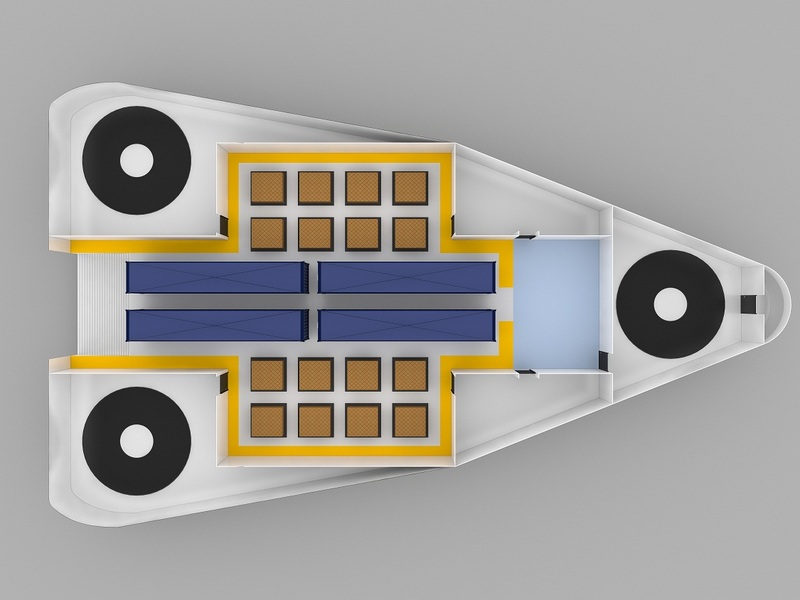 Inter-island operations as an “air” ferry for both passengers and cargo utilizing harbors for landing areas eliminating the need to build airports where there is limited space or danger to the environment. AeroCat’s unique capabilities make it ideally suited for transporting supplies following disasters. AeroCat can carry these supplies directly to the point of need without having to go through staging areas, as is the case with transport by ship or conventional airplane. AeroCat can also be equipped as a mobile hospital to attend to the injured or as an air ambulance to evacuate causalities. Its VSTOL capability on both land and water enable AeroCat to operate almost simultaneously in various areas of the same disaster zone.